Here comes a very inappropriately timed non-content post! So sue me. The cover for Lauren Beukes new book, Zoo City, hit the interwebs today. Her first book, Moxyland, came out last year, and it was one of my favorites (Full Review). ...it's a muti noir set in a re-imagined Johannesburg. It's the story of a girl with a sloth on her back, a dirty 419 habit and the magical ability to find lost things who gets drawn into a case to find a missing pop star. Regarding the cover, I think I liked the Moxyland cover better because the picture file missing icons were very striking and it took that step toward non-traditional stylistic SFF covers that I encourage. At the same time, this is a strong cover that does it's job well. Anyone who reads my cover commentaries knows, I'm not a fan of character-centric covers usually but the way John Picacio integrates the animals into their faces (Zoo? City) makes me wonder if there is some type of integration between the animals and the people. I don't have any idea if it would be a The Golden Compass-esque daemon system or some type of blended DNA but based on the title and the cover, I wouldn't be suprised. The cold and warm color tones also remind me of the Pyr Fast Forward anthologies. Probably because they were also done by Picacio who has a definite style. Any clue on how to describe it though? Also, bonus points for avoiding any potential Liar-esque RaceFail. The newer genre imprints have much more forward-thinking publicity and art departments than some of the New York dinosaurs who are only interested in the bottom line. 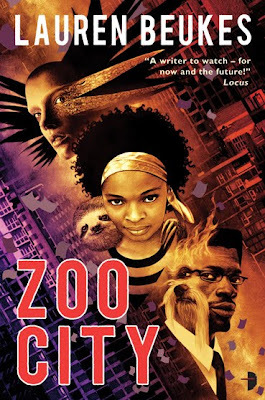 As far as I can tell, Zoo City comes out in May 2010 in one of the English speaking countries. I'll be sure to grab it when it does. Stay tuned for more details and possibly an interview with Lauren herself.